Last week, we made Layered Potato and Spinach Enchiladas as we drank Tequila Fresca and snacked on nacho. A good time was had by all. If you did not have a good time, you did something wrong. Those enchiladas were delicious. And they were easy. But I still had some oopsies along the way. And so, in the grand tradition of that one other time I offered you my leftovers, today I give you my enchilada leftovers — the things that didn’t make the cut. Mistakes are part of what make cooking fun. Enjoy mine. I wanted to show you how to make my layered vegetable enchiladas last night. I couldn’t. I couldn’t because our fridge is packed so full that I could not fit another thing in it, much less the ingredients I needed to make the dish. I’ve been cooking faster than we can eat lately, despite hosting two dinner parties in a row this weekend. I cook, and shop at Costco, as if I’m a caterer, regardless of how many people I’m serving. I admit it. I have a problem. I say, if you’re going to have a problem, make it a delicious one. Like cooking too many meals. And whisky! So, in an effort to make room in the fridge, we had leftover spinach and goat cheese tarts from one of the dinner parties, and a dish I made up last week with what I happened to have. 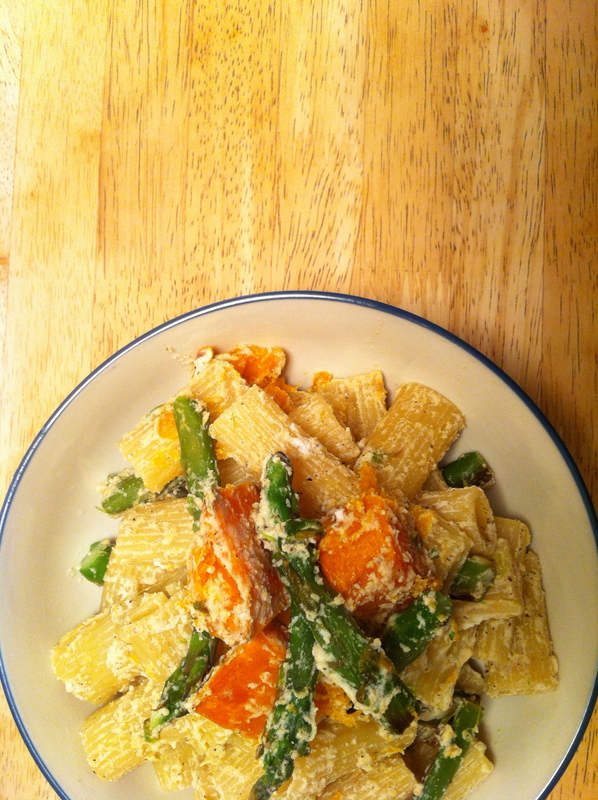 It turned into rigatoni tossed with butternut squash and asparagus in a ricotta cream sauce. I’m having a lot of fun cooking for you. But most of my fun moments are the ones nobody will see — the oopsies that get cut out of the final videos. But then it occurred to me … why not share my leftovers with you, too? So, today, I give you the leftovers — what was edited out of my first few videos, and a few things you haven’t seen yet. Cooking should be fun. Mistakes happen. I’m also a grown man staying up late at night talking to a camera on a tripod in his kitchen in the name of documenting his cooking. Odds were pretty good that my conversations with the camera wouldn’t always make sense.